I've looked through this book at least a dozen times. It reminds me of the hours that I spent playing with my dolls ... way back in the 1960s (okay, it is a faint memory). 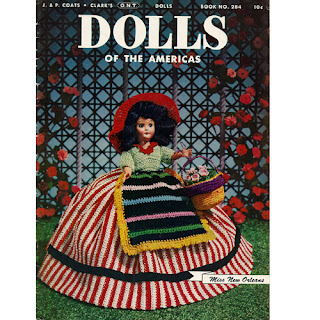 How I would have loved to have had dresses like the ones presented in the 1952 issue of Dolls of the Americas by Coats & Clarks. Not only are the individual patterns deliciious, the presentation is guaranteed to bring a smile. Here, let me show you. Our cover is Miss New Orleans. Even with the apron, this outfit is a must have for all southern belle's. The swirl of Gypsy Girl's skirt is splendid. 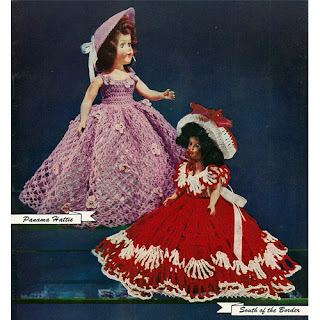 And, don't miss the arm ruffles and hat on Miss Rio! 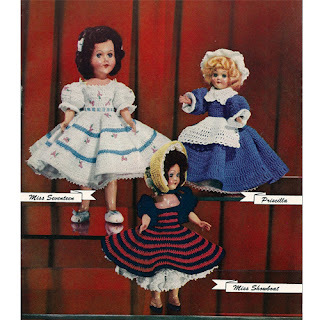 Here our girls have petticoats. Don't miss the little shores on Miss Seventeen. Wonderfully full circle skirts ! Just envision the twirling about to happen. Did you notice the little flowers on Panama Hattie dress, or the little ribbon details on both? This doll is smaller than the others, and her whirly girls party dress makes her a perfect little sister to the others. 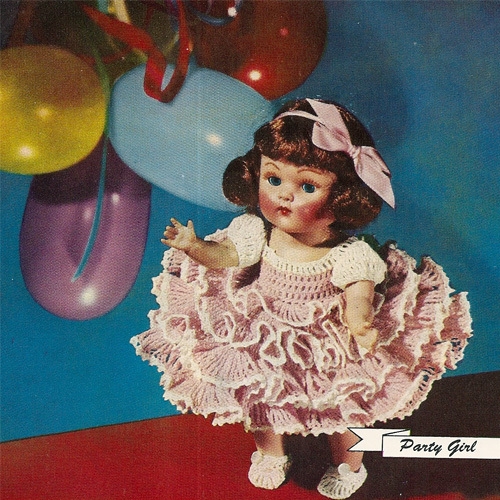 And here, Prairie Rose, visits the desert in her sundress and bonnet. 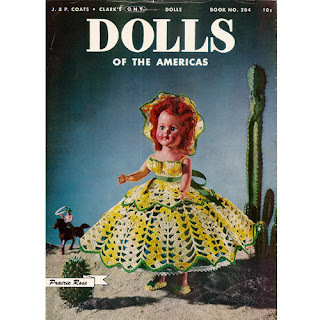 (Don't miss those tiny shoes and exaggerated bodice). Do you suppose the horseman in the background is about to lasso her? The patterns are designed for dolls in either the 8 or 11 inch size (one or the other; not both) All the patterns are crochet and made using J&P Coats and Clarks O.N.T. Threads. 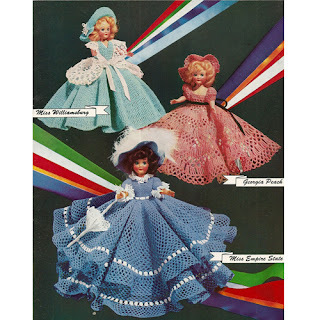 So, do you think that Mothers' crocheted these dresses for their girls' dolls? 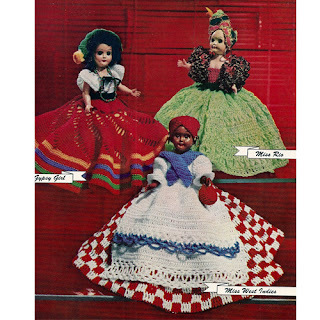 Or, were these strictly show pieces in that time period? 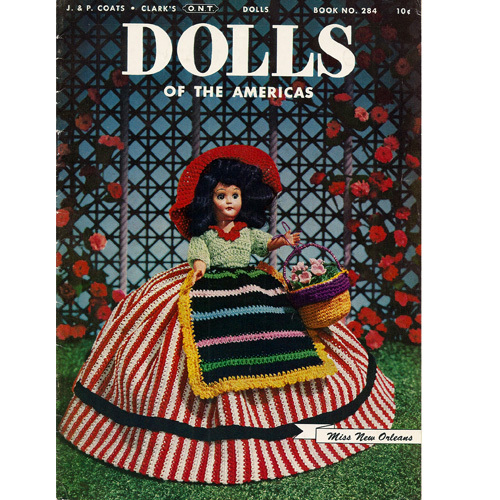 I'm thinking that one of you might like to stitch these up for your girls (alter slightly for Barbie) dolls. One or two of these dresses, and she'll create memories that will never go away. I've listed this book in PDF format in my shop.